Lookout folks, we might have a competitor for best in show here! 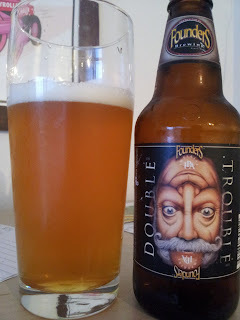 This tastes better than most single IPAs do... oh boy, what an outstanding imperial IPA. It's got some heft to it, as you'd expect, but is not overly malty, and is nicely bitter (86 IBU). I guess you're probably assuming it's hoppy too. Well hell yes it is, and in the ways you want: both aromatically and flavorfully. There's a lot of lemon zest type flavors, but also plenty of traditional 'hop' flavors. You know what I mean, right? Either way, a healthy burp gives you a chance to test your hop tasting skills all over again. Nice. If I had to compare this to something I would say, perhaps, the Super IPA (see, we can't escape the clutches of Alpine! ); but, this is drier and a little more punctuated--cleaner tasting if you will. Dreadnaught has it beat in terms of the complexity of flavors added by the hops they use, but this is nonetheless a mighty fine IPA with a great NSP. I would have a tough time choosing almost any imperial IPAs over this, but since we don't get much from Founders around these parts, I'll just stick to Alpine, which has been through an extensive vetting process around here. The Duck-Rabbit Hoppy Bunny A.B.A.